So, another happy costumer who has no idea what he can write about Steve’s gorgeous work that has not been said already. So I’ve dicided to have a look back at how I came to buy one of his coats at all. I’m from Germany and Doctor Who is almost unheared of here. 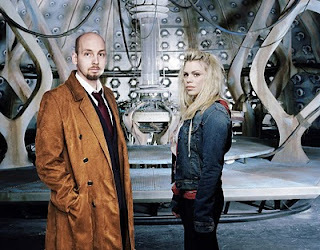 The 2005 Series ran in television two years ago but with very little success and was cancelled very fast. Still I watched some episodes and liked it quite a lot. 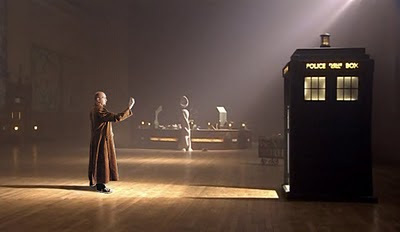 When David Tennant took over from Christopher Eccleston, I found that rather strange (having no idea about this whole regeneration stuff) and I gave up on the series. Quite a mistake, as I found out a few month later, when I remembered the show and gave it another try. I really liked Tennants Doctor and what very soon cought my eye was the Doctors new look. This long, smoothly flowing coat did just look amazing and worked just well with a suit. I always liked long coats, but never saw anything like this. Everything I’d found before was somehow looking like from an old Western and that was just not the thing. So, after seeing that coat on Tennant I kept looking for anything like it in the shops, but, of course, there was nothing there. I had never been into cosplay so not knowing where else to look I considered google and ended up with the obvious sites. Magnoli was the first thing I found, but at that time spending such a fortune on a piece of clothing seemed rather ridiculous. Besides, the pictures of the Magoli Coat didn’t make me want it that much, it looks way to stiff, the colour didn’t seem right and after looking at some costumer images i was sure that this was not it. Next place to go was ebay, and drawn in by the cheap price I ended up ordering a coat there form the seller tssy2005. Those people were nice enough and the coat arrived quite soon. It does look ok, considering the price, but it was nowhere near the real deal (see right). Just to start, the lining was black and it didn’t really fit around the shoulders (which was probably my mistake in measuring). I wore it a couple of times, but it felt more like a costume than anything else and I was looking for something that I could wear on an everyday basis without feeling strange and dressed up. So the search began again, considering Magnoli again (by now I was willing to pay the price for something that would feel just right) and only now I found Steve’s blog. I was intrigued by the pictures that I could see there. I started reading and was even more intrigued by the amount of detail that he put into his work, analizing pictures from the show, finding the right fabric (or a close enough substitute) and improving here and there as he went. Then I got to the entry about him making a coat for someone else. And this was it, here was someone who knew what he was doing and there was the possibility that I could get one costum made by him. I got into contact with him and the communication was very friendly, he offered sending fabric samples and everything you could ask for. But after the experience with the coat from ebay I had doubts about me being able to get the measurements right. As well, I wanted to get a close up look at his work before I went spending the money. Since I went to London in January anyway I asked Steve if he would have me over to get a look at his work and to take the measurements himself. His reply couldn’t have been more inviting and so, one day in January, I went to his place, we had a nice chat, a nice cup of coffee (I’m still sorry for spilling some on the carpet) and then I got my close up look. At the moment I saw that coat hanging on the wall I was lost, there was no question I would leave without ordering my own. It just did look like right from off Tennants body. You know how tricky the original coat is with the light and it’s colour changing, but what I saw there did look just the way I imagined it. Steve offered me to try it on and it was a perfect fit! Man, this thing felt great! Just like it was made for me. Since Steve had mentioned that he was about to make a new one for himself I just had to ask: Would he sell me this one? Would it be possible to get this coat right here and now? Of course, it was. So I had to decide, would I take his coat now, or would I wait for one that would be made to my measurements, perhaps try a different fabric that might be even closer to the original coat? Well, I guess you can imagine that there was no way I could walk out of that place without the coat ;-) Why wait for six weeks when this coat was a perfect fit? So, after a little trouble with paypal I managed to draw the money from ATM and went back to London with a Tennant coat. Couldn’t quite believe it then. I just had wanted to look at Steve’s work and then decide if I would order one and here I was with that coat under my arm. An evening later it had it's official introduction when I went to see Wicked in London and I just knew the decission had been right, wearing it felt so much different then with the eBay-thing. I guess that around this time I would have gotten the coat if I had ordered a new one, but I never regretted the decission to buy that used one from Steve because the material is really good and there was no sign of wear at all on the fabric. And besides, this way I had the opportunity to wear it much longer before the weather gets to warm for an overcoat. And each day of wearing it was a real joy. As I said before, here in Germany almost nobody knows about Doctor Who, so here the coat is just some extraordinary piece of clothing and I got a lot of compliments on it from friends and colleagues. 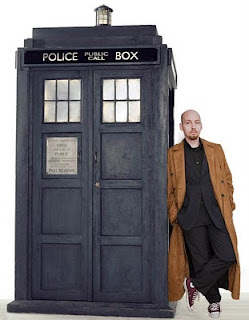 So, as I final word, if you are looking for a Tennant coat, this is where you should get it. As someone else mentioned before, Steve’s work is second to none! Every time when I watch an episode these days I might spot some detail of the coat and think that he can’t have noticed that. Of course, he has! Steve work ist the closest you will get if you’re not going to steal the Original from BBC archives. And besides his brilliant work, Steve is a very nice and friendly guy, the contact via email was always very fast and meeting him was a real pleasure. Especially because he doesn’t just wan't to sell you his stuff and make some money. He wants you to be happy with what you spent your money on and is very open in talking about any problem that might come up (not that there has been any problems). So Steve, thank you very much for your hospitality, and keep up the good work. I’m still looking forward to seeing a coat with the darker colour.